Father George: so fond of his bedsocks that they get worn out. [Since he is not bedridden I can only surmise he does not restrict their use to the bedroom!] Hence - by request - here are some more. The patterned section of the sock is knitted sideways using a variation of a honeycomb stitch; it's an opportunity to use up really small amounts of double knitting yarn. I rotated 4 contrast colours but you could use a different colour for every set of rows; the key is to keep some consistency in the main colour. 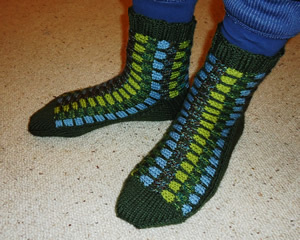 The first section of these socks is knitted sideways making a "T" shape where the upright of the "T" is the upper foot, and the cross bar curls around the leg to form the cuff, meeting at the back seam. The second section knits the heel and then sole of the sock. These two sections are worked on 2 needles. Then for the toe, you pick up the stitches from the first 2 sections, and knit in the round on 4 needles, and finally you pick up stitches at the top of the sock and knit the welt, also in the round. Starting at the back leg seam, with main shade (M) cast on 23 sts on 2 needles and knit one row. Commence pattern. 3rd row: As first row. 5th row: Using main shade (M) purl across all sts. 6th row: Using C2, k1, sl1, * k3, sl1; repeat from * to last st, k1. 7th row: Using C2, p1, sl1, * p3, sl1; repeat from * to last st, p1. 10th row: Using main shade (M) knit across all sts. Repeat rows 1-10 using different contrasts, once more. Continue to work the pattern on these 63 sts, working rows 1-10 three times, and then rows 1-4. Continue to work the pattern on these 23 sts, working rows 6-10, then rows 1-10 once, times, and then rows 1-4. Cast off purlwise using main shade (centre back seam). 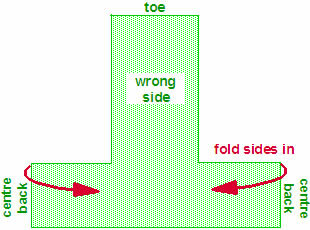 Second section (heel and sole). The remainder of the socks are worked entirely in the main shade. Pick up and knit 11 sts from the left side first, ending at the cast on edge (which will be the centre back, and then turn the work over and bend round the second side, and pick up 11sts from the right side. The sock cuff now forms a circle with the back seams together, but not yet sewn. Turn and purl 1 row across these 22 sts. Next row(right side facing): * Sl1, k1, repeat from * to end. Repeat the last 2 rows 10 times more. Next row: Sl1, k12, k2tog, k1. Turn. Next row: Sl1, p5, p2tog, p1. Turn. Next row: Sl1, k6, k2tog, k1. Turn. Next row: Sl1, p7, p2tog, p1. Turn. Continue to work short rows and decrease in this way until all sts have been incorporated. [14sts]. Next row(right side facing): Sl1, k13, pick up and knit 13 sts down side of heel. Turn. Next row: P27, pick up and purl 13 sts down other side of heel. Turn. Next row: K1, sl1, k1, psso; knit to last 3 sts, k2tog k1. Turn. Repeat the last 2 rows until 22 sts remain. Continue to work a further 50 rows to make the sole - upper and lower foot sections should be about the same length. Now we move to working in the round. Knit 11 sts on first double-pointed needle, 11sts on second, then with right side facing, using third needle, pick up and knit 24 sts across the toe edge of the first section. Complete the round, knitting 11 sts from first needle then 11 sts from second. Knit one more round. Next round: K1, sl1, k1, psso; knit to last 3 sts on third needle, k2tog k1; on first needle, k1, sl1, k1 psso; knit to end; on second needle, knit to last 3 sts, k2tog k1. Repeat the last 2 rounds until 16sts remain. Slip the sts from the second needle on to the first and graft the sts together with those on the third needle. 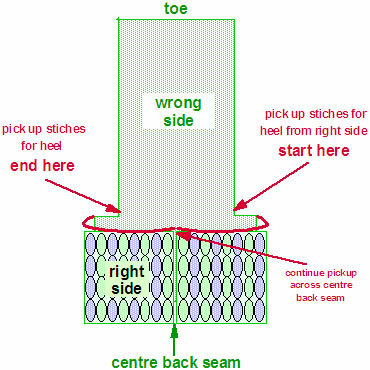 Sew seams on each side of the sole, using a flat seam technique (not mattress stitch for example). Using double pointed needles and main shade, pick up 60-66 sts round top of sock and knit a k3/p3 rib for about 8 rows (or as long as you want), to form the welt. Cast off loosely. 2 x 50g balls of double knitting yarn, and a variety of left over DK colours. One pair and one set of four No 8 (4mm) needles, pointed at both ends. M is main shade (olive). I used Phildar Oxygene in olive for the main colour, and a 4 other colours for the contrast - you could have every colour change (15 colours) different if you wanted.